Protected by a patented filter system, the COUGAR Ash Vac removes warm and cold ash from your stove/fireplace in the most convenient and safe way. The 2-layer ash filter system protects against fire, captures extremely fine particles and does NOT expel ash at start up for complete dustless ash removal. An Instant Filter-Cleaning Agitator Rod keeps suction strong while trapping ash where it belongs, in the canister and out of your home. The fire-resistant 6-gallon canister holds up to 3-gallons of ash for multiple cleanings and the powerful 6 AMP motor is designed with a unique, sound-muffling cover for quieter operation. 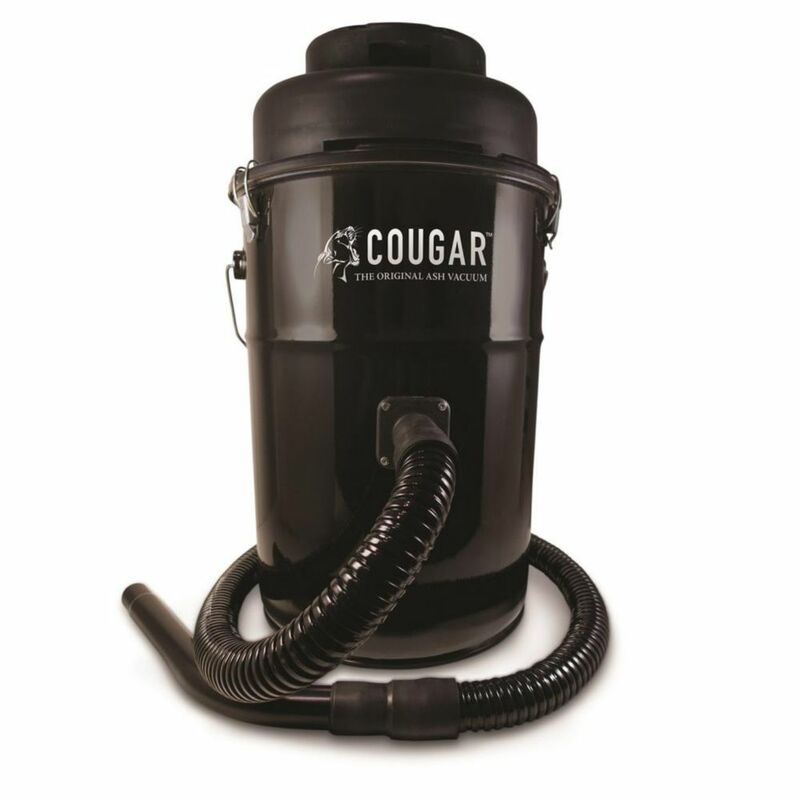 The COUGAR is engineered for outstanding ash clean-up, USA made, and backed by a 3-Year Warranty. The Dirt Devil EZ Lite Bagless bagless canister gives you whole house cleaning from floor-to-ceiling with a telescoping wand and multiple attachments. This bagless canister vacuum lets you clean carpet, hard floors, upholstery, drapes and other surfaces. The variable speed control lets you create the perfect amount of suction and the bagless dirt cup is easy to empty. The Hoover Elite MultiFloor Pet canister vacuum helps you clean everyday messes with ease. The advanced multi-cyclonic system ensures no loss of suction and helps lift dirt and debris. The Elite multi-floor pet canister is lightweight, maneuverable and versatile, so it can tackle all of your floor surfaces. Additionally, the air turbine multi-floor nozzle and 3-in-1 tool helps you clean any floor type, stairs and above floor areas that most traditional upright vacuums just can't reach. Now you can clean easier, so you can get back to what matters most. COUGAR Ash Vacuum Black Protected by a patented filter system, the COUGAR Ash Vac removes warm and cold ash from your stove/fireplace in the most convenient and safe way. The 2-layer ash filter system protects against fire, captures extremely fine particles and does NOT expel ash at start up for complete dustless ash removal. An Instant Filter-Cleaning Agitator Rod keeps suction strong while trapping ash where it belongs, in the canister and out of your home. The fire-resistant 6-gallon canister holds up to 3-gallons of ash for multiple cleanings and the powerful 6 AMP motor is designed with a unique, sound-muffling cover for quieter operation. The COUGAR is engineered for outstanding ash clean-up, USA made, and backed by a 3-Year Warranty. COUGAR Ash Vacuum Black is rated 4.1 out of 5 by 9. Rated 5 out of 5 by Lorraine from Excellent product! We love our new ash vacuum. It has dramatically cut down on ash dust in our home and is so convenient we use it almost daily during the winter. Rated 5 out of 5 by evrydzaholiday from glad I bought it! what a difference from the "other" vaccuum I was using. No more poofs of dust when starting and running this vaccuum! Rated 1 out of 5 by n2914mr from Overpriced...overrated. Not sure why all the glowing reviews of this ash vac. It has obvious design flaws...the hose port is plastic and prone to warpage/burn-thru (it happened to me within the first week), as well as it being mounted so low on the carrying can you can really only accumulate a few inches of ash before the suction stops altogether and needs emptied. It's equipped with a metal hose, yet all 'ash' travels through a plastic port attached to a metal can. Why not make the port metal/aluminum/brass/stainless as well?? Also, the hose continually falls off despite the barbs that should keep it in place. I put tape around it to secure it because it became such a nuisance. The only positive is it does contain the dust that would otherwise circulate throughout the house. Loveless CS is quick to respond and accommodating to questions/problems, but this ash vac warrants no accolades. I purchased based solely on the positive reviews and wanted a dustless vacuum for my fireplace insert. Bottom line: other models can be had for the half the price without the inherit design setbacks. And, if this is their 'quiet' model...more engineering needs put into place. The decibel level is way too high even compared to a conventional shop-vac. Rated 5 out of 5 by Anonymous from Cougar ash vac This vac is well worth the money ! I use this vac once or twice a day while pellet stove is going,just dial back the pellet feed and let the flames go down then start vacuuming out the hot ash(no red or really hot ambers)but it handles really hot ash just fine and you won't see any ash or dust belching out the exhaust from this vac either. With good pellets I have been able to run the stove 3 weeks straight without shutting down to vac the stove out. Yes its expensive , but its worth every penny . Rated 5 out of 5 by Maggie from Great ash vac... We've had this ash vac for a year now and have had no problems at all with it. Works great, has really good suction and is easy to empty. Pretty much maintenance free. One person complained that the hose clogged.....it does if you suction up pellets....which it tells you not to do! You can't go wrong with this ash vacuum!! Rated 5 out of 5 by Halcar from Does what others wont PROS: It does the job its intended for, to vac ash and smalls partials. We use ours for our pellet stove. No dust, easy to assemble, quitter then a shop vac and some Home Vacuums! CONS: I'd like to have seen a holder for the hose, thats it! Final thoughts: So far, we've used it 5 times, with no need to empty it yet. You can't go wrong with this unit and I've not had one problem at all with it.